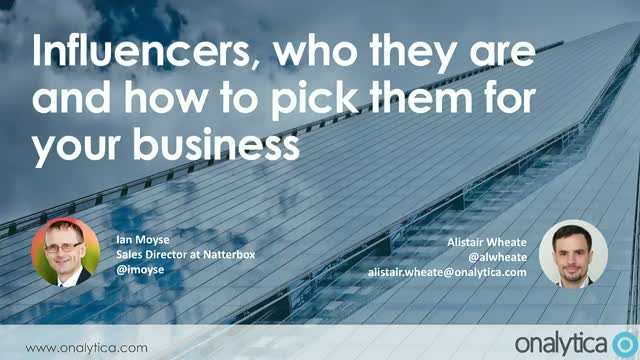 Join us on June 21st on our webinar where we will be discussing what makes an influencer, who they are and how to pick them for your business. We are very lucky to be joined by top Cloud & Social Selling influencer Ian Moyse who is the Sales / Channel Director for Natterbox Limited. Ian was recently awarded Sales Director of the Year (Institute of Sales Management). He is a board member of the Cloud Industry Forum & FAST and a LinkedIn Top 10 Tech Power Profile. Brands are working with influencers to create marketing partnerships based on mutual value exchanges, to more effectively communicate with and influence their target audiences. These partnerships include activities such as speaking at events, co-creating content and networking with senior executives. It is therefore imperative that the influencers brands partner with can be trusted and that they share the same brand values so their voice is aligned to the brand’s messaging and that they are a good fit. In this webinar discussion featuring Mark Schaefer, Konstanze Alex and Tim McLoughlin we will explore how brands need to look beyond the quantitative influence numbers to decide which influencers to work with. Konstanze Alex is the Influencer Marketing lead at Dell. Her focus is on driving a robust global strategy for influencer content co-creation that positively impacts Dell's Share of voice. Mark Schaefer is a globally recognized blogger, speaker, marketing consultant, author and executive branding coach. He teaches graduate marketing classes at Rutgers University and has written six best-selling books. Tim McLoughlin is the Global social media head for Hotels.com encompassing all brand social media marketing across the world. He manages a team across four locations, in North America, Latin America, Europe and Asia. He has won awards for his work and talks about advertising at conferences around the world. We're very lucky to have 3 top FinTech influencers join us for this discussion on the importance of writing a good brief when working with influencers. • Specificity vs flexibility – is it important to be very specific with an influencer about what you’d like them to do or should you accept it’s better to let the influencer have some freedom to say what they want? • Give vs take – how should brands think about the ‘give and take’ in terms of working with an influencer. • What are the sort of things that an influencer values when working with a brand? • What are the sort of things that an influencer can offer a brand? Chris Richards - Global Marketing Manager at Barclays RISE. Chris oversees the Rise social media strategy and platform content delivery for its 6 FinTech Accelerator Ecosystems dotted around the globe. Elizabeth Lumley - Internationally recognized as one of the leading voices in FinTech and banking technology innovation. She is a well-established global conference speaker, as well as conference organizer and speaks on services, regulations, risk, data and technology in investment, retail, and global transaction banking. Chris Gledhill - Lead Mobile Architect and led the disruptive innovation labs at Lloyds Banking Group before becoming CEO and Co-Founder of FinTech Startup Secco. Chris has both a technical & business background with expertise spanning a wide range of disruptive technologies including Blockchain, AI, API, Big Data, Deep Learning, Virtual Reality, CryptoCurrencies, Biometrics, Mobile & Wearables. Using case studies from around the world with companies from both the B2B and B2C world Neal Schaffer will be sharing examples of how social media influence can form an integral part of your marketing and PR campaigns in 2018. Whether you want to work with influencers externally or boost the reach and influence of your own team Neal will share best practice examples that can be deployed both for short term campaigns or as part of a longer term strategy and practical tips for how to get started for those new to influencer marketing and new ideas for the seasoned pro. Neal Schaffer is a leading authority on helping businesses through their digital transformation through consulting, training, and helping enterprises large and small execute on social media marketing strategy, influencer marketing, and social selling initiatives. President of the social media agency PDCA Social, Neal also teaches digital media to executives at Rutgers University, the Irish Management Institute (Ireland), and the University of Jyvaskyla (Finland). Fluent in Japanese and Mandarin Chinese, Neal is a popular keynote speaker and has been invited to speak about digital media on four continents in a dozen countries. He is also the author of 3 books on social media, including Maximize Your Social (Wiley), and in 2018 will publish his 4th book, The Business of Influence, on educating the market on how any business can leverage the potential of influencer marketing. Neal resides in Irvine, California but also frequently travels to Japan. In this webinar we will look at three ways to engage with influencers in a B2B context to support your content marketing, lead generation and PR activities. We will also look at what criteria to consider when choosing which influencers to work with for each type of activity. We were very lucky to have 3 of the top Women in Tech Tamara McCleary, Rachel Miller and Theodora Lau join us in this discussion. We talked about why the number of women in tech is decreasing and what we can do to help create a more diverse workforce and gender-equal industry. Why do brands engage with influencers? Is it just to try and “reach” the audience of those influencers? Or is there more to influencer engagement than just being an alternative form of advertising? Are consumers wising up to the influencer-for-hire model, and how will changes in regulation and social network policies change the way brands work with influencers? Join me for our webinar on Thursday 12th October at 4pm BST where I will answer these questions by discussing the 4 main reasons why brands engage with influencers on social across B2C, B2B and B2G, and how things will likely change going into 2018. In the talk I will explore the pros and cons of each approach to influencer engagement and what marketing and comms teams need to consider with each approach.